DENSO®-Gleitmittel (lubricant) is a semi-solid compound for use on mechanical seals in concrete pipes and manhole components. Can be used in cold, heat and rain. Usage temperature range from -10°C to +50°C (+14°F to +122°F). Optimum lubrication even with rough surfaces. Material compatibility in accordance with DIN EN 681-1 with rubber seals. DENSO®-Gleitmittel (lubricant) is made from organic materials and inorganic fillers. 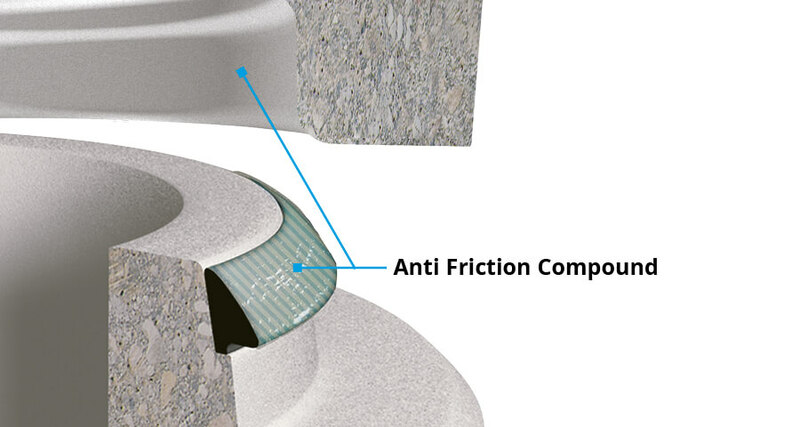 By applying the lubricant on rubber seals and concrete surfaces, as is required in sewer construction, the excellent material consistency and shear strength make merging the spigot and socket a simple process that is gentle on the components – even on rough concrete surfaces. DENSO®-Gleitmittel (lubricant) has been successfully deployed for decades in sewer construction and silage plants and is used across the world to install channel and shaft seals simply and reliably.